How do I copy my giving day profile over from a previous giving day? 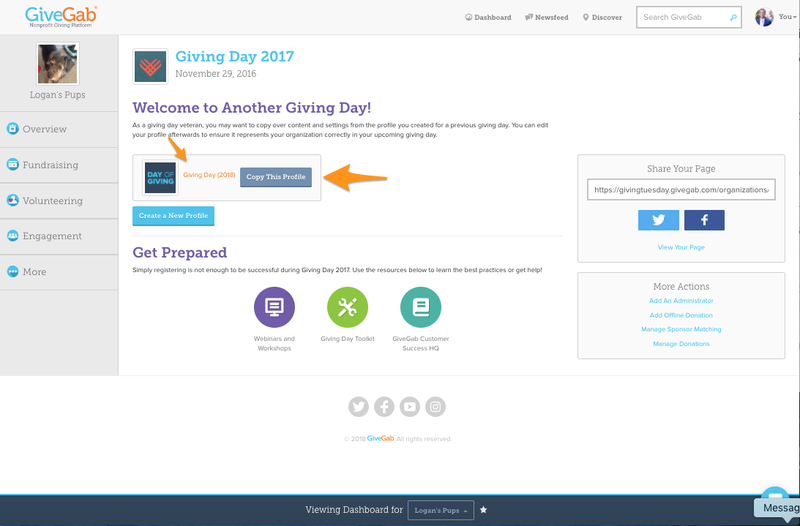 From the Overview Tab of your Admin Dashboard, click on the blue "Edit Profile" button to the right of the Giving Day. Step 3: Select "Copy This Profile"
On this page, you will see a blue, "Copy This Profile" button, and the page to which the information will be copied to (small arrow) to the left of the button. Once you complete Step 3, all the information from the profile you copied will automatically be placed onto your current profile! Feel free to make any changes you'd like to refresh or update for the new year.